This drive is a great taste of the kind of speeds we want. More, please! After testing Sandisk’s new Extreme 900 portable SSD, I just have one question for the rest of the industry: What’s taking so darn long? We’ve waited seemingly forever for 10Gbps USB 3.1 devices to arrive, and the Extreme 900’s 800MBps performance has us wanting more. Unlike Samsung’s pint-sized T1/T3, the Extreme 900 is roughly the dimensions of a typical external 2.5-inch hard disk drive. It’s somewhat chunky and heavy at that, though quite handsome. You’ll be able to slide it into larger pockets. I talk about its heftiness, but far more important is this drive’s incredible performance. Two reasons for the Extreme 900’s size are heat dissipation and shock resistance. A bigger cause is SanDisk’s use of two TLC (Triple Level Cell/3-bit) NAND-based, 6Gbps SATA SSDs inside. Squeezed in with them are the controller and bridge chip required for running them in RAID 0—the only way to leverage 6Gbps SATA into 10Gbps performance. 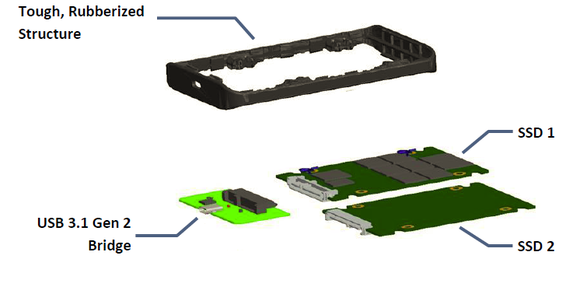 After SATA RAID, the next performance step would be PCIe SSDs and a multi-lane PCIe-to-USB bridge chip. 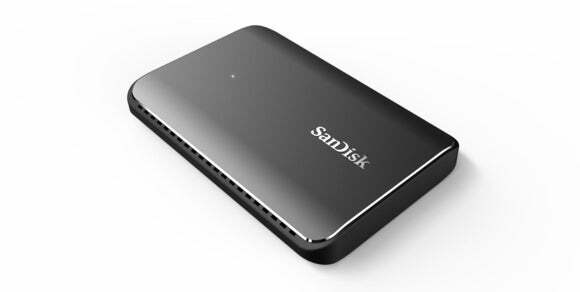 The Sandisk Extreme is built using two SSDs running striped in RAID 0. The Extreme 900 features a USB Type C port and ships with both Type C-to-Type C, and Type C-to-Type A SuperSpeed cables. It’s a nice inclusion, but it’s not as great as it could be: Not every USB-C device you plug this storage drive into will support 10Gbps USB 3.1. Right now, a USB-C port can mean everything from USB 2.0 speeds to 10Gbps USB 3.1. It can also mean Thunderbolt. Welcome to the messy world of Type C ports. The reversible Type C USB connector is handy, but no guarantee of 10Gbps USB 3.1 speed. The Sandisk Extreme 900 is available in 480GB, 960GB, and 1.92TB flavors that retail for $400, $600, and $1,000, respectively, and carry a three-year warranty. However, I found the drives online at Amazon for about 20 percent less, which puts them on par with Samsung’s T1/T3 price-wise. 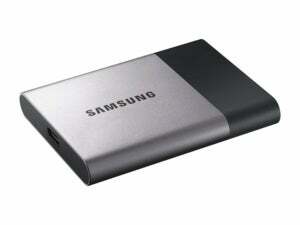 Compared to other external USB hard drives, which currently run about $75 a terabyte, that’s expensive. But for roughly six times the price, you get roughly six times the performance. How many products of any type can say that? For our first test, we trotted out AS SSD, which rated the Extreme 900 at 796MBps when reading sequentially. Because of Extreme 900’s TLC NAND, AS SSD write performance varied from 781MBps when the TLC-as-SLC (Single Level Cell/1-bit) cache was in play, to 598MBps when the cache was exceeded. In normal use, you’ll generally see the higher number. 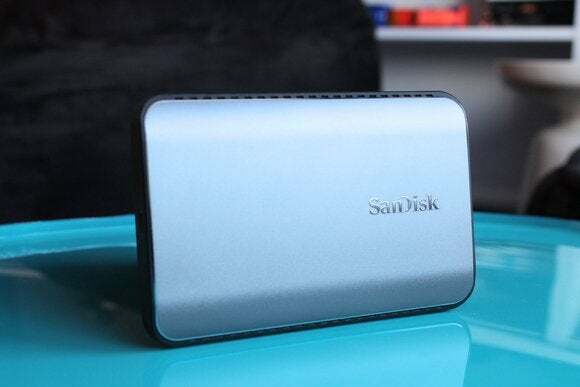 But either way, we’re talking about an external drive that’s almost 400MBps faster reading, and at a minimum, 200MBps faster writing than its closest competitor. Note that Sandisk wouldn’t tell us how much TLC was used as SLC cache, but in the industry so far it’s generally between 1.5% and 2% of total capacity. Reading/writing a single 20GB file hit speeds of 666MBps and between 550MBps and 454MBps, respectively. The speed was again dependent upon whether the cache was in play. If we started consecutive operations too soon, the numbers dropped. Note that our real-world copy tests are always slower than the numbers generated by synthetic benchmarks. The Extreme 900 ships formatted in universally readable/writable exFAT, so it can be used with any device that can deal with USB mass storage. But exFAT is the performance kiss-of-death when writing (not reading) small files and folders; formatted in exFAT, it took the Extreme 900 nearly four minutes (84MBps) to copy our 20GB mix of files and folders. After reformatting to NTFS, that dropped to 89 seconds (224MBps). Even with NTFS, that’s considerably slower than the sequential numbers. There’s one large caveat with 10Gbps USB 3.1 in general: You’ll find it only on newer PCs, and not even all of those. 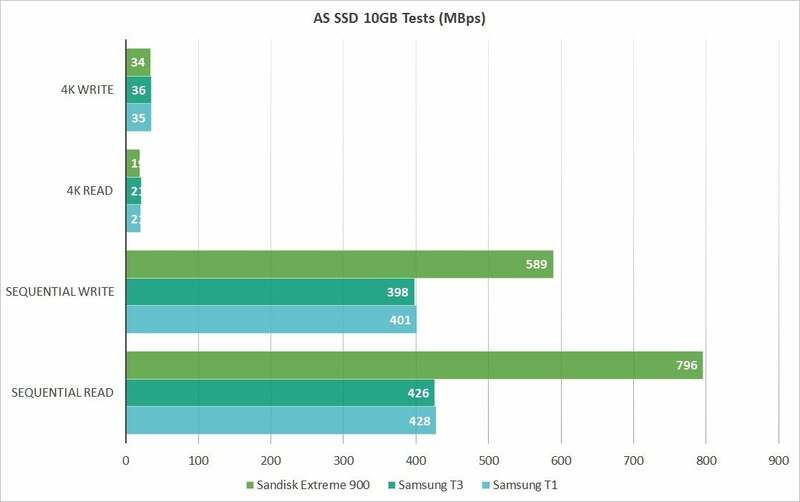 To benchmark SanDisk’s drive on our year-old testbed, we had to grab a $36 Atech Flash Technology Blackbird MX-1 USB 3.1 Gen II Host Card add-in card. It was well worth it, but it’s a solution that laptop users won’t be able to enjoy. Instead, laptop owners are stuck with whatever their machine supports out of the box. On laptops with Thunderbolt 3.0 ports, you’ll also get 10Gbps speeds, but only on those using Intel’s high-speed Alpine Ridge controller. Even so, the Extreme 900 is a good performer using 5Gbps USB 3.1 or 3.0. It clocked write speeds of 420MBps and read speeds of about 410MBps—as fast or faster than any external USB SSD on the market. And, of course, you get your speed bonus when you move to 10Gbps USB. 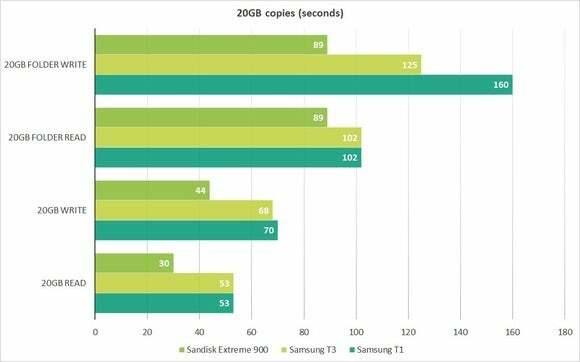 The Extreme 900 bested Samsung’s T1/T3 by a considerable margin using USB 3.1 Generation 2. It was also faster on USB 3.x Gen 1..Note that we actually saw up to 780Mbps writing, but we stuck with the slower results. (Longer bars are better). Color me impressed. Not only is SanDisk the first major player out there with a 10Gbps USB drive, but the company has implemented it extremely well. I wish MLC (Multi-Level Cell/2-bit) NAND were used, for more consistent write performance, but even the TLC numbers are impressive. The upshot is that the Sandisk Extreme 900 has permanently banished 5Gbps drives like the T1 and T3 to ho-hum-ville. Begone!